I have decided to make several sets of cards to give as gifts and was really pondering what I should use as my backgrounds and if I should include any greetings. Cards without greetings are always more versatile in that they will be appropriate for more occasions but they need good sketches to work. Because I had washi tape sitting on my desk I decided to play a little and see if I could make up a few backgrounds. In an effort to reduce the size of my paper stash I wondered if it would work to use decorative scrapbook paper for my backgrounds. I went looking through my stash and found a few sheets that I thought might work as they were somewhat subtle in pattern and intensity of colour. So I cut up this sheet of paper - a checkered background with quite a few different colours finely spattered over it. Next, I checked out my washi tape supply and found a few that worked reasonably well with the paper. I simply cut or tore the washi tape into strips and applied them to my trimmed pieces of decorative paper. While, I was at it I made four sets of backgrounds using four sheets of decorative paper. I put those to press and started dreaming up some embellishments that would be substantial enough to balance the backgrounds I had created, large enough that they would not need greetings and versatile enough in subject matter that they would be appropriate for more than one occasion. I started by digging out any dies I had that fit the bill as to size and subject matter - hearts, flowers, butterflies, birds, etc. 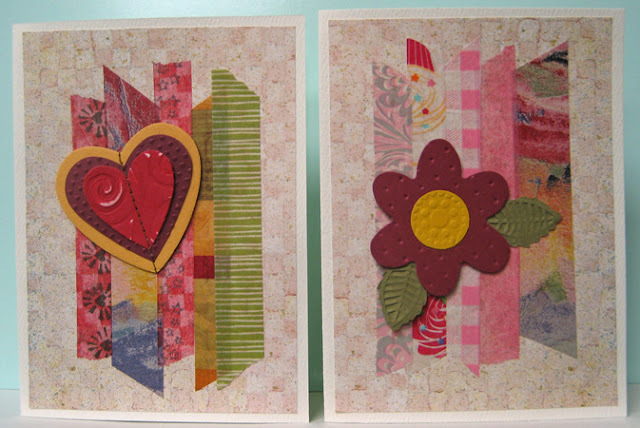 For my first, card I layered three different sized hearts. The large one is a die cut (CB), the middle one is an embossed heart die cut (SU) and the final one is die cut (SX) cut from white solid core cardstock which I embossed and sanded. I put just a bit of glue between them to hold them in place and machine stitched them to each other adhering the thread ends to the back with regular tape. I glued my background to an off white card (a bit smaller than A2) and then adhered my 3D embellishment to the card front using 3D foam tape. That worked pretty well!! 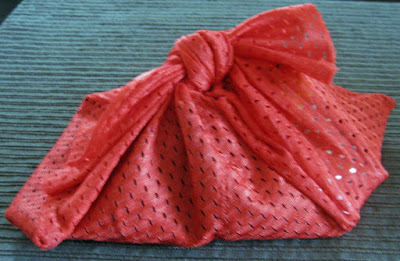 Now the challenge was to see if I could come up with a few more embellishments that worked as well. For my second card, I cut a maroon flower (SX), manually embossed it with the Swiss Dot embossing folder (CB) using a hammer, added a manually embossed circle in the center then two leaf punchies which were also manually embossed and mounted this focal element to my card front to which I had already mounted my washi tape background. 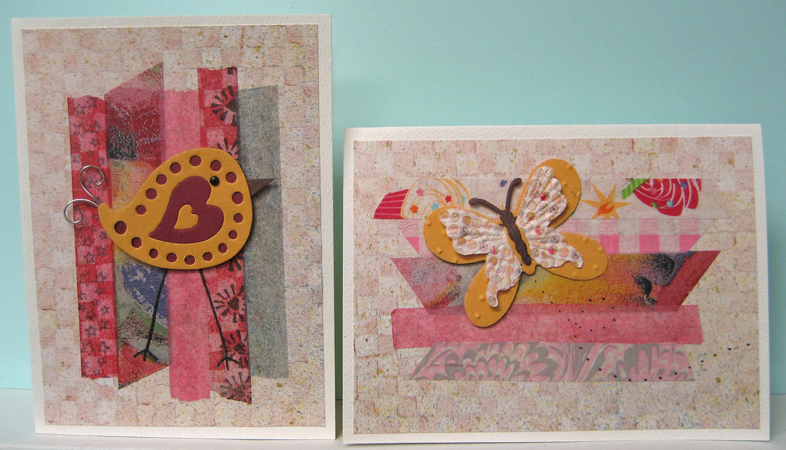 For my third card, I mounted my washi tape background to my off white card and then worked on my embellishment. I cut this paisley pattern (SX) from both dark pink and yellow. I swapped the pieces to create a yellow paisley with a dark pink heart and a small yellow heart and secured them with tape on the back. The holes were too hard to situate so I simply cut a dark pink shape that was just smaller than the whole and glued it to the back and shows in all the holes. Decided that it looked a bit like a cute bird with a heart wing and added a tiny black brad for an eye, a tiny brown triangle for the beak, swirly wire tail feathers and mounted it to my card front using 3D foam tape. Finished it off by adding two legs with a black permanent marker!! For the fourth card in this set, I die cut a butterfly (SX) from yellow cardstock and overlaid a paper butterfly that I had in my stash and to finish it off added a body and antennae that I die cut (QK) from a butterfly die set. I glued them together just in the middle so the wings would be free to flutter. Added it to my layered card front using 3D foam tape and used a black permanent marker to add a dotted flight path. I am pretty happy with how this set of cards turned out!! So I will continue to work on my other card sets and will share them here as I finish them up! !